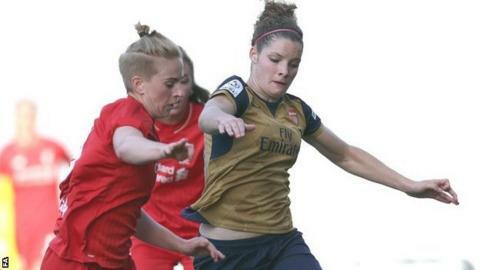 Jordan Nobbs marked her first league start since the World Cup with a goal as Arsenal Ladies beat Liverpool Ladies to keep alive their title hopes. Arsenal had lost their last two Women's Super League fixtures but dominated against struggling Liverpool and could easily have won by a greater margin. Natalia missed a glorious first-half chance, shooting wide from the penalty spot after Alex Scott was felled. But Dominique Janssen's fine free-kick and Nobbs' strike secured victory. Nobbs suffered a hamstring injury playing for England at the World Cup and only made her first competitive start in the Continental Cup win over Reading in late August. But she looked sharp in an impressive team display at Liverpool's Select Security Stadium that takes Arsenal up to second in the table, two points off the top, but having played a game more than leaders Chelsea. However the Gunners had to stay patient with the breakthrough not coming until the 66th minute when Dutch defender Janssen scored with a superb low free-kick. And Nobbs doubled the away side's lead and ensured the victory with ten minutes remaining when she slotted home Scott's pull-back. Liverpool Ladies: Stout, Harris, Bonner, Longhurst, Omarsdottir (Smorsgard 78), Dowie, White, Zelem (Staniforth 63), Pacheco, Hodson, Murray. Subs not used: Darbyshire, Ryland, Dale, Green. Arsenal Ladies: Van Veenendaal, Scott, Mitchell (Ubogagu 57), Stoney, Losada (Bailey 83), Pablos (Yankey 66), Nobbs, Carter, Corredera, Rose, Janssen. Subs not used: Byrne, Sampson, Humphrey, Kelly.